• Before submitting online application a sample application format may be filled and furnish correct information. • Keep pass port size photo readily with them. • Utmost care should be taken while filling the online application. • The candidate is responsible for any mistakes committed by him in online application and no further corrections shall be entertained. • Mere appearing for admission test will not confer any right on the student for admission into Model School. Students after satisfying above conditions, have to pay fees through mee-seva, online centers with particulars and obtain General number. Mere obtaining general number will not be considered unless he/she submits the online application. The general number is only in evidence of payment of examination fee. After obtaining general number they have to submit online application to http://telanganams.cgg.gov.in/ (online). 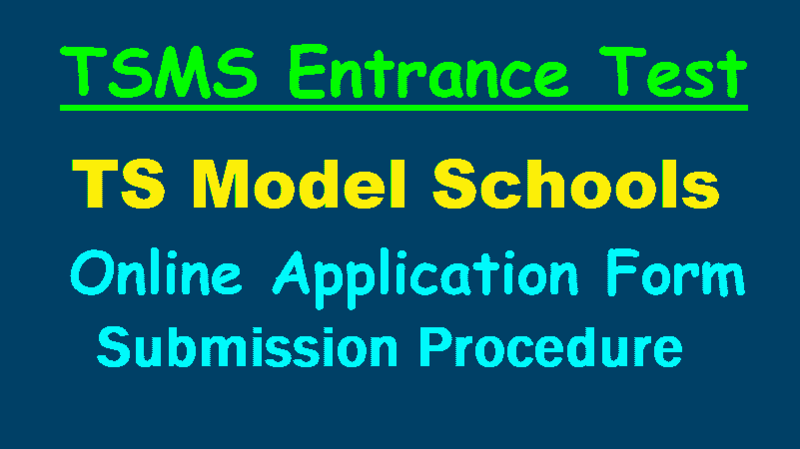 The list of Model Schools and application formats are kept in website http://telanganams.cgg.gov.in/ and download the same. Center for conducting examinations will be at District Head Quarters (Name of the Center will be printed in the Hall Ticket). Hall Tickets can be downloaded online as per reference number allotted to the candidates (as per schedule indicated supra). ix) Amount: this field will be filled automatically. a) Fee once paid will not be given refund. Candidate should go through the Detailed Notification and ensure the eligibility before making payment. b) When a candidate makes double payment by mistake, refund can be considered only on bringing it to the notice of CGG by mail within 7 days of making such payment. Any kind of requests beyond this 7 days period will not be entertained. The refund process via same source of payments made in such cases will be initiated in Three to Five working days after receiving the refund request in all eligible cases of refund. This clause is applicable only in case of multiple payments by a candidate for the notification. c) If, due to any reason department cancels notification and decides to refund the fee, the amount will be returned duly excluding the processing fee involved in making such payments. d) During the process of making payment by the candidate, by any chance the amount is deducted from the candidate and the same has not reached CGG account is automatically refunded by the Payment gateway provider on bringing the issue to the notice of Payment Gateway service provider. After selecting the payment method, you can click on the make a payment button. After completion of payment method, "Transaction successfully completed" Page will be appeared. In this page you can copy the journal number and download this pdf file for future reference. a) Details furnished in the application are final. Subsequent requests for corrections will not be entertained for wrong filling of application. iv) Upload Photograph with Signature of the applicant. a) Paste the Photo on any white paper and Sign below. Ensure that the signature is within the box. Scan only the photograph along with the signature. Please do not scan the complete page. b) The entire image consisting of the photo along with the signature is required to be scanned and stored in .jpg format on local machine. Ensure that the size of the scanned image is not more than 50kb.If the size of the file is more than 50kb, then adjust the settings of the scanner such as the dpi resolution, no. of colours etc., during the process of scanning. After Upload the Details of Fee and Candidates Photo, Click on the radio button of declaration and Click on the upload button.